Wealth can make a person believe they are self-sufficient. That is its real danger. Obviously wealth can buy stuff: sumptuous food, fine jewelry or clothes, fancy cars and houses. It can even provide a simulacrum of friendship or even a mate (everybody has a price, right?) Enough wealth can make a person powerful in business and politics. With enough wealth and power, one can seem totally independent and invulnerable. But wealth cannot cheat death. And after death comes judgment. How did you use all the riches, position, and power? Merely for yourself or for the good of others? But self-sufficiency is not just a danger of the rich. I have lived hand to mouth all my life and am fiercely independent. I do not like asking others for help. My natural inclination is to not trust people and, if at all possible, do it myself. But I realized at one point in my life that if I ever wanted to be able to love others, I would have to acknowledge my lack of love, my total insufficiency and allow Love to enter my life. I let the God who is Love make me a part of himself. I was, in fact, convinced by the man, Jesus, who gave his life out of love for me, who was crucified, died, was buried, and on the third day rose from the dead. God of the living and the dead, do not let the riches and pleasures of this life deprive me of knowing and following you. Help me not live as an owner of things but as their steward. I give back to you everything I have, everything you have given me, to be used for your purposes. I acknowledge you as my master. Continue to use me and whatever wealth I have as an instrument to bring about and further your kingdom. Amen. James B. Janknegt: The Rich Man and Lazarus, Lenten Meditation # 30 in James Janknegt’s Lenten Meditations, 2017. 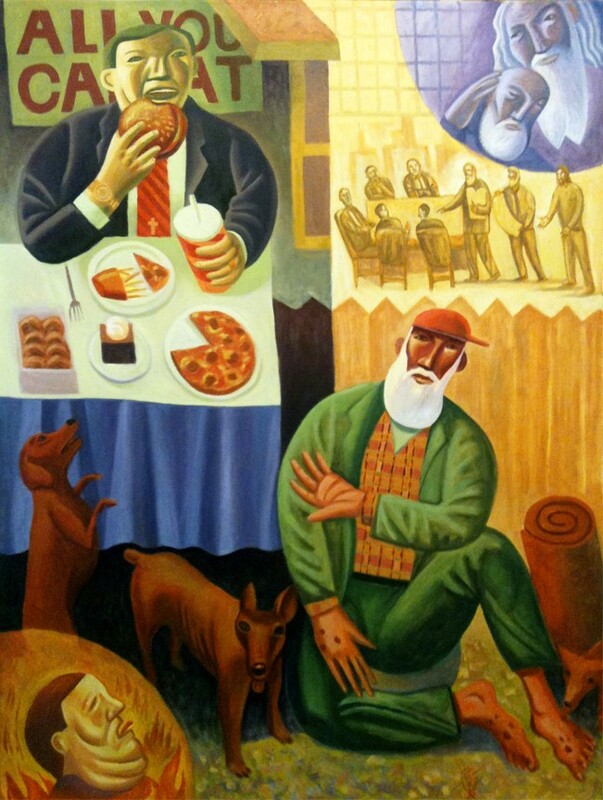 Over the last 16 years Janknegt painted 40 paintings based on Jesus' parables. He has put the paintings into a book of Lenten devotions: one for each day of Lent along with the scripture the painting is based on and a brief meditation and prayer. The book is 92 pages, full color throughout, soft cover with a great foreword by W. David O. Taylor and beautifully designed by Danny Schweers. The book is $20.00 plus shipping and can be purchased via www.bcartfarm.com/books_lent.html. James B. Janknegt was born in Austin, Texas, USA. He attended art school at the University of Texas in Austin and graduated with a BFA in 1978. He left Texas and moved to Iowa City to attend graduate school. Upon graduating, with an MA and MFA in 1982, he moved back to Austin and began exhibiting his work in many galleries and museums around Texas and the United States. While in high school Jim became a Jesus Freak and sang in a folk group. The Janknegts converted to Catholicism in 2005 and were received into full communion in 2007. In 1998 the Janknegts moved from Austin to Elgin, Texas where they have an ArtFarm. Jim worked full time to pay the bills and painted in his off hours. He retired in 2015. When he is not painting he enjoys reading, building things, gardening, tending to animals and camping. He also enjoys watching movies and listening to music.